These easy-to-use instructions are also available for download in PDF format. We call this stable form of cocoa butter crystal seeds produced by EZtemper "silk". A small quantity of EZtemper silk can be used to pre-crystallize chocolates, ganaches and other mixtures that benefit from tempering, with beautiful results. Pre-crystallization of chocolate requires between 0.1 and 1% of the stable form of cocoa butter crystals (beta crystals or "Form V" crystals) in order to set up with the snap, shine and mouth feel associated with well tempered chocolate.  EZtemper will allow you to consistently provide those stable crystals and allow you to work with the chocolate at a higher temperature than usual to ensure increased fluidity and ease of use. Note: lid SWINGS, it does not lift. Lid mechanism will be damaged by lifting. After plugging the unit into the wall socket - insure that the plug from the adapter to the unit itself is also securely in place. Switch on both the fan switch and the power switch on the top of the unit. A light on the switches will indicate that they are on if power is getting to the unit. For best results, start with cocoa butter that has been stored at an ambient temperature of 20ºC to 30ºC for two or more weeks. Place a quantity of cocoa butter in one or both of the stainless container(s) supplied with the appliance and put the lid on the container. Each container will hold about 150 grams of cocoa butter depending on the cocoa butter format. You may need to chop the cocoa butter into smaller pieces before putting in the jar. If you anticipate requiring larger quantities of cocoa butter silk for your production - add cocoa butter to two or more stainless containers. Place the container(s) in the EZtemper. SWING the lid closed. Make sure the unit is turned on. It may take up to 12 hours for the cocoa butter to attain a silky consistency. When you think it is ready stir the mass to remove any lumps. When there are no more lumps in the cocoa butter and it has reached the a silky consistancy it is ready to be used. Cocoa butter will contain a critical percentage of form V crystals between 33 and 34º C. The EZtemper is shipped with a factory set temperature of 33.6 C, an ideal setting for most commercial cocoa butter. To change the set temperature on the EZtemper - hit the SET button once and you will see [SP] appear on the top display. Use the up and down arrows to choose the temperature you wish between 33.0 and 34.0 C. Hit the SET button a second time and you will see [Sŗ] - this is a timer function that should remain at 00.00. If you accidentally set this timer an alarm will sound when the time is reached - the unit has been programmed not to shut off should that happen. In order to stop the alarm simply hit the SET button twice and use the down arrow to return the unit to 00.00. When you hit the SET button a third time your new settings will be applied. Help! My cocoa butter is still lumpy. Help! My cocoa butter is too runny. Cocoa butter from cacao that is closer to the equator is harder than that from cacao further away - the cocoa butter used may necessitate adjustments in the temperature. If after 12 hours any lumps have not softened and the cocoa butter has not reached a silky consistency you may need to adjust this temperature. Start with an increase of 0.1º C degrees initially. Check cocoa butter silk texture 4 hours after each adjustment. If your cocoa butter silk seems too fluid (noted by melting on the cocoa butter surface) - you may wish to decrease the temperature by 0.1-0.2º C.
If cocoa butter is completely melting you may have been sold cocoa butter that contains non-cocoa butter fats. Palm oil and other non cocoa butter fats are liquid between 33 and 34ºC. Check out our detailed Tempering Formulae here. Bring the product you wish to pre-crystallize to a temperature between 28 and 33.5°C, depending on the application, before adding the required amount of silk. Cocoa mass, chocolate, or coloured cocoa butter should be between 32 and 33.5º C, whereas ganache, meltaway or gianduja can be closer to 28º C.
Since you are introducing the stable form of cocoa butter crystals you need only wait a minute or so before using your product. If used to pre-crystallize melted chocolate, the chocolate will remain in temper for as long as the chocolate is not overheated. As it cools you can reheat to the initial temperature without throwing your chocolate out of temper. It will over crystallize as time goes on and you will find that you can push your temperatures higher - up to 34.5 for dark chocolate. 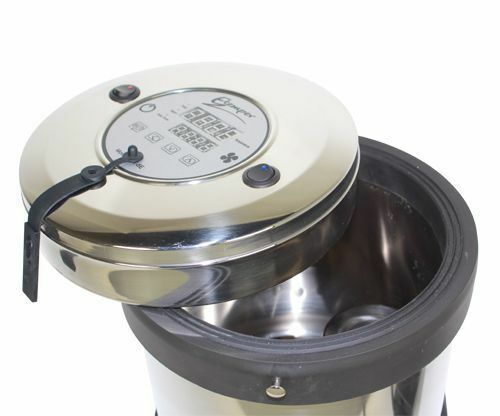 The EZtemper unit is easy to maintain and clean. The unit should not be immersed. Spills can be simply wiped with a damp soapy cloth. It is not unusual for cocoa butter crystals to form a film on the black silicone parts of the appliance. This may require wiping on occasion with a warm soapy cloth. The stainless grid at the bottom of the unit and stainless steel containers may be safely cleaned in the dishwasher. Be sure to rinse and completely dry all components before next use.